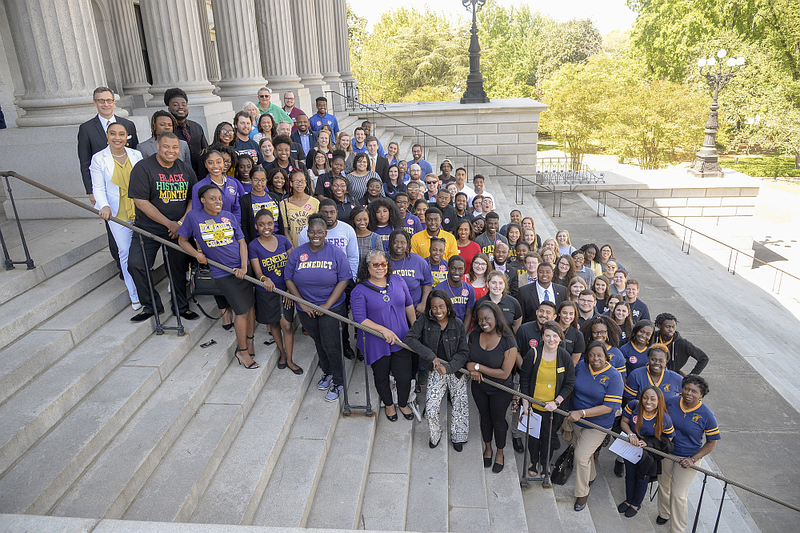 SCICU students celebrated their record-breaking legislative letter-writing campaign at 2019 State House Day. Tuition grant recipients attending SCICU colleges and universities wrote more than 9,000 letters to SC General Assembly members during the 2019 legislative session. Photo courtesy of Mark Olencki, Wofford College. COLUMBIA, SC — Members of the General Assembly once again felt the immense power of grassroots advocacy in receiving more than 9,000 thank-you letters from SCICU students during this year’s legislative session. The 9,000 letters easily eclipsed the old record of 8,200. SC senators and representatives received student letters thanking them for their continued support of the SC Higher Education Tuition Grants program. These need-based grants are an essential component of financial aid for SC residents who decide that their best choice for college is at one of the state’s independent colleges. Nearly two-fifths of in-state residents who attend SCICU member colleges and universities receive tuition grants. Students from Anderson University and Erskine College again led the letter-writing campaign among all SCICU colleges and universities. Anderson University, with a total of 1,678 letters written, won the challenge for most letters written to SC senators and representatives. Erskine College again earned bragging rights for having 100% of their tuition grant recipients write letters to SC General Assembly members.